The College for Financial Planning® has been the premier provider of financial services education since 1972. In fact, the College created this country's first financial planning education program—the Certified Financial Planner™Professional Education Program—as well as the certification. Today, the College remains at the forefront of the financial planning field by listening and responding to the needs of the industry and individual customers. We continue to expand our role by improving and introducing education programs and learning tools that serve your needs as a professional. As a private, for-profit educational institution, our mission is to provide accessible and flexible degree programs to our students. Our philosophy of professional education emphasizes the relationship between theory and practice. We provide students with the conceptual foundations and practical skills necessary to adapt to changes in societal needs and keep pace with the evolving fields of finance and financial services. 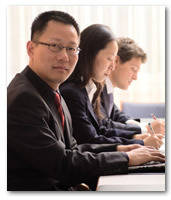 The College provides learning opportunities to people in all geographic areas through comprehensive programs of study that lead to licensing or certification through individual courses; through graduate-level study in the areas of financial planning, financial analysis, and finance, leading to the award of a master's degree. The College for Financial Planning® combines flexibility with high standards to provide a tailored distance learning experience for adult students. The College provides courses in both self-study and instructor-led formats. Instructors create custom-designed study and instructional materials to complement the curricula, while also incorporating relevant textbooks, Web resources, and additional resource materials. All faculty and staff can be reached by e-mail, phone, or fax for academic counseling. Student Services Center representatives are available to help you with any questions you may have regarding courses, scheduling, and testing. As a College for Financial Planning® student, you can access the Apollo Digital Library, virtually housing over 17 million articles and 2,500 academic journals, receiving approximately 1 billion user visits per month. You can also access special subscription pricing for Wall Street Journal and Barron's. College for Financial Planning is regionally accredited by the North Central Association of Colleges and Schools (30 North LaSalle, Suite 2400, Chicago, IL 60602-2504; 800-621-7440). The College for Financial Planning, Inc., has been authorized by the Colorado Commission on Higher Education to offer instruction for and to grant the master's degree. Online, instructor-led classes, self-study, and asynchronous online learning. Internet access required, high-speed preferred but not required. Our personal financial planning major utilizes US tax laws, however all of our programs are open to international students. There is no on-campus requirement. Scholarships available, please contact our financial aid office. A representative will contact students to guide them through the enrollment process.